The total area of the province is around 31,900 km². The oblast is bordered on the west by the Kiev Reservoir of the Dnieper River and Kiev Oblast, by the Sumy Oblast to the east, and the Poltava Oblast to the south. The northern border of the oblast is part of Ukraine's international border abutting Belarus's Homyel Voblast in the north-west and the Russian Bryansk Oblast in the north-east, respectively. The oblast is bisected into northern and southern sections by the Desna River, which enters the Dnieper just north of the Kiev city limits. 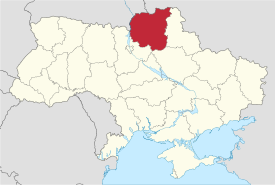 Chernihiv Oblast was created as part of the Ukrainian Soviet Socialist Republic on 15 October 1932. The capital city of Chernihiv has known human settlement for over 2,000 years, according to archaeological excavations. The Chernihiv Oblast comprises a very important historical region, notable as early as the Kievan Rus' period, when the cities of Chernihiv and Novhorod-Siverskyi were frequently mentioned. The city of Chernihiv was the second most important Ukrainian city during the Rus' period of Ukrainian history, often serving as a major regional capital. Danylo of Chernihiv wrote of his pilgrimage to Jerusalem during this era. The numerous architectural monuments of the city bear witness to the invasions suffered, including those by the Tatars/Mongols, Lithuanians, Poles, Russians, and Nazis. On the territory of the region took place numerous tragic events such as Battle of Kruty, Tragedy of Kryukivka, and many others. The oblast is located in the historic region of Polesia (Ukrainian: Полісся, translit. Polissia). The local administration of the oblast is controlled by the Chernihiv Oblast Rada. The governor of the oblast is the Chernihiv Oblast Rada speaker, appointed by the President of Ukraine. Detailed map of Chernihiv Oblast. The Slavutych municipality is located in Chernihiv Oblast on the eastern bank of the Dnieper, but officially belongs to Kiev Oblast (being an administrative exclave). The current estimated population of the oblast is around 1,055,673 (as of 2015). The population of the oblast is predominantly Ukrainian, with minority Belarusian and Russian populations concentrated in the northern districts. The province has experienced long-term population decline. The population has fallen 23% from the 1959 figure of 1,554,000, the steepest decline of any Ukrainian oblast. It has the lowest population density in the country. The religion among believers in the oblast is overwhelmingly Eastern Orthodox. A substantial percentage of the population is atheist. Small minorities of Ukrainian Catholics, Roman Catholics (including the descendants of earlier Polish colonists), and recent converts to Protestantism are also present. There are a few outstanding historical Orthodox churches and buildings in Chernihiv, Novhorod-Siverskyi, Liubech, Nizhyn (Nezhyn) and Koselets' (a city of Ancient Rus', older than Kiev). Nizhyn is an historical cossack city and home to a university. Chernihiv region was famous for its specific style of folk icon-painting. Brightness and realistic depictions of the saints were typical for it, with red and hot yellow paints used. The icons were decorated by flowers which reminded of Slavonic pre-Christian traditions. The icons from Chernihiv region were spread outside its territory. Many of them are preserved in the Museum of Ukrainian home icons of the Radomysl Castle. Most of Ukraine's oblasts are named after their capital cities, officially referred to as "oblast centers" (Ukrainian: обласний центр, translit. oblasnyi tsentr). The name of each oblast is a relative adjective, formed by adding a feminine suffix to the name of respective centre city: Chernihiv is the centre of the Chernihivs’ka oblast’ (Chernihiv Oblast). Most oblasts are also sometimes referred to in a feminine noun form, following the convention of traditional regional place names, ending with the suffix "-shchyna", as is the case with the Chernihiv Oblast, Chernihivshchyna. This page was last edited on 7 March 2019, at 20:51 (UTC).